The Grenfell Tower disaster has been a tragic wake-up call. We have seen how destructive fires can be and how much devastation they can cause in a short amount of time. 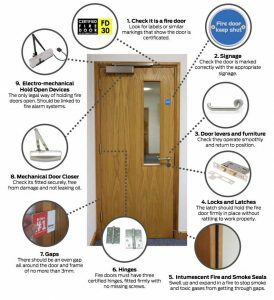 It’s high time we recognise the importance of fire doors and the crucial role they play in restricting the spread of fire and smoke. According to a survey of more than 1,000 tenants living in flats by Atomik Research, 58 per cent of all tenants do not know who the ‘responsible person’ is for ensuring their buildings are fire safe. Even worse is that 53 per cent of people would not know how to spot a dodgy fire door, according to research shared by the Chief Fire Officers Association (CFOA) in September 2016. Please ensure that your fire doors are in good working order. 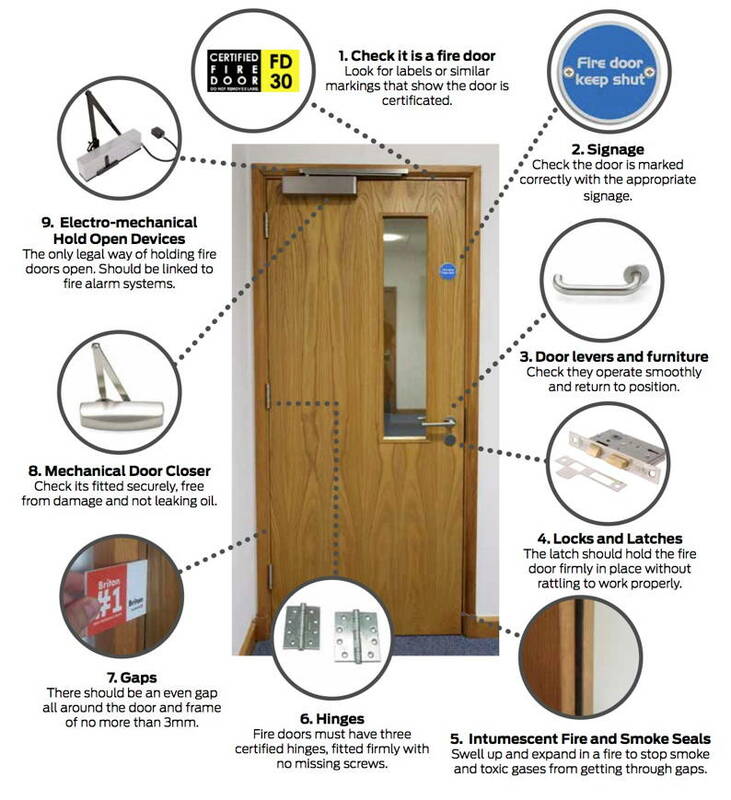 Here are 10 recommended checks for common problems with fire doors. As news emerged that more than 1,000 fire doors were missing from Camden tower blocks in the wake of Grenfell Tower’s fire, the most important check is making sure that an assumed fire door is actually an authentic fire door. All fire doors display certificates and relevant markings to verify their fire integrity. Check for a label or a plug on top or on the side of each door for a fire-resistance rating. If there isn’t one, it is most likely not a fire door and will not protect you in a fire. Gaps around the fire door should be 3mm or less to stop smoke and fire from getting through. To check, try slipping an old £1 coin between the fire door and the frame, which is about 3mm in thickness. Door handles and panic bars should be easy to use. If they do jam or grind, then it means they need cleaning. In a fire, it goes without saying that you should be able to escape quickly and easily. On fire doors, there must be a minimum of three hinges, and all screws must be tight. Check that the hinges are free of metal fragments and oil leakage, as this could be a sign of dangerous wear and tear. Close your fire door and shake it back and forth to see if it is loose or rattles. If it does, then there’s a problem. Fire doors should not rattle and should be fully engaged with the strike plates. If they do not latch, then dangerous toxic chemicals and smoke will escape around the door and cause visibility and breathing problems. Fire doors need door closers, and those door closers need to be fitted and set correctly to help fire doors fully close to the frame. Check the door closers by opening and releasing the fire door. If the door does not close, then the door closer could be the problem and needs adjusting. Classic signs of door closer malfunctions include wear and tear, oil leakages and metal fragments. Fire doors should never be propped open by objects. Doing so is illegal; however, they can be held open legally with electromagnetic devices. These devices run on electricity and are linked to the fire alarm system in the building. When the fire alarm sounds, make sure the doors release immediately and close fully into the frame. By law, all fire doors must have proper signage, so users know they should be kept shut. Exit devices, such as panic bars, must be in working order and give users immediate exit. Try conducting a practice fire evacuation drill and running through the panic exit. If it takes you longer than ten seconds to get through the door, then the panic exit needs to be looked at and possibly replaced or repaired. Fire doors must be fitted with intumescent seals to stop smoke from getting through the fire doors. The first check is that they are not missing from the fire door. Secondly, they must be in good condition. Check also that the seals are well-attached inside the groove in the frame.